Hephesto's Forge: Something worth fighting for...........? We've all be there, two armies duking it out, given it all to get that much needed victory. And when the dust clears and your men move in to secure that vital objective what do they find? That's right, a see-through plastic marker that mocks everything they stand for. 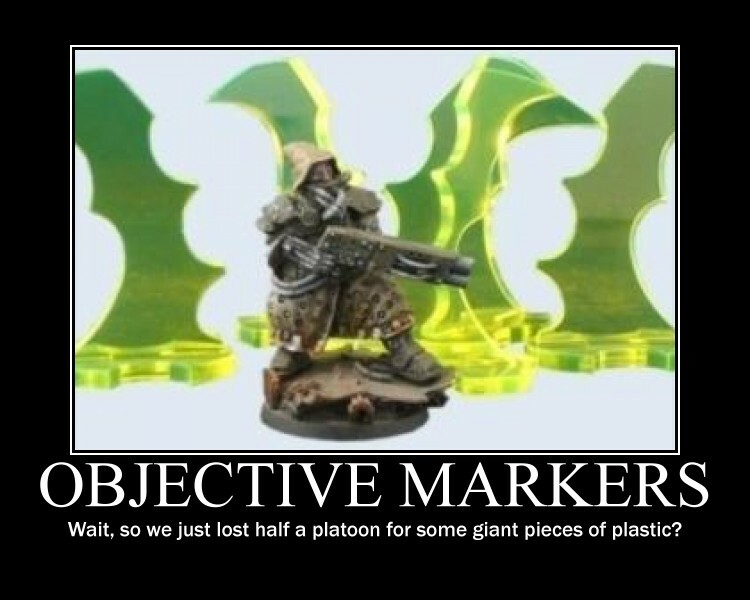 There are a ton of games out there that, at least once every X games, require the use of Objective Markers and I've noticed that more and more gamers seem to be switching to the use of nice, shiny, plastic objective markers. Which, especially at a tournament level of gaming, can be a quite useful tool to keep things managable. At the same time, it does somewhat pain me to see custom-made objective markers slowly disappear. I am an extremely easy-going gamer, not in the least because in only get a handful of them in each year, but I quite simply find it a shame to see a superbly converted and painted army fighting over simple plastic tokens or even coins! If you look at how much time and effort people put into their stunning armies it just seems odd to me that they don't do the same for their objective markers. 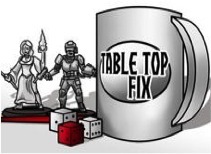 This is especially true for games that already require the use of markers for action points and abilities where the table quite simply slowly gets covered by plastic tokens. For me there's a simple solution, for official games and tournaments bring out those handy markers. However, for your everyday, casual game with friends or at the gaming club, why not be a bit more ambitious! 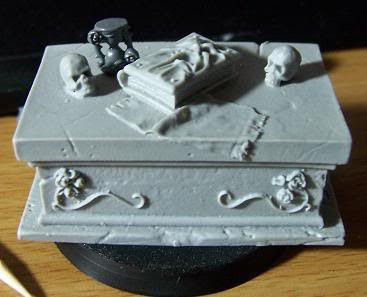 Why not grab some spare bases and parts to make some fun objective markers for your armies. 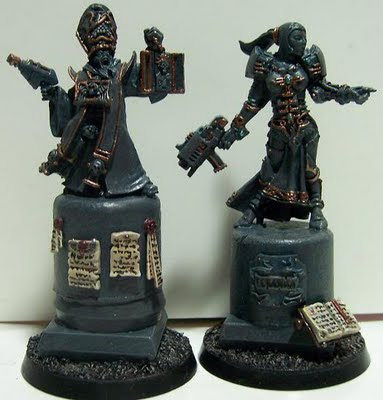 I've recently helped run two contests focused on just this and everybody, casual and competive gamer alike ended up having a ton of fun simply putting together something specific to their own army. For those interested click here to see what the Astronomicans came up with, there's quite a few cool markers in there! Making your own Objective Markers can be an extremely rewarding part of the hobby and you can make it as complex or simple as you want. Everything from spare weapons and loot to fully sculpted creatures and statues is within reach. I can certainly recommend it to everybody out there who like sto put extra effort into creating some background for their armies. Trust me, if you keep in mind you'll be needing a few markers while putting together your minis you'll have a few cool ideas and markers in no time. And if all else fails, turn to random leftovers from the real world. A hot summer afternoon, a popcicle stick and some basic hobby tools led to the rather entertaining, random marker found below. Naturally this is just my take on a very small segment of the wargaming experience, but it has definitely made the hobby more fun for me. I'd love to hear what the rest of you guys out there think about this. Do you use standard markers? Do you make your own custom objective markers and if so, let me know what your favorites ones are! And that rounds up my thoughts for today, but tomorrow I'll be uploading a few more mini and kit reviews! Interesting take there, it does indeed take a bit more work to make your own markers. So it may very well be better suited for the more serious & dedicated gamer. Looks like you had your "Sunday Best" on when your published this post and I hope you don't mind that promoted it over at my blog The Chaos Manifesto. Good to hear it was of use to people, anything to get a few more homemade markers out there right ;-) Thanks for discussing it on the Chaos Manifesto HOTpanda, always nice to hear people enjoyed a post! Found you on Chaos Manifesto! Awesome post man! Completely agree! 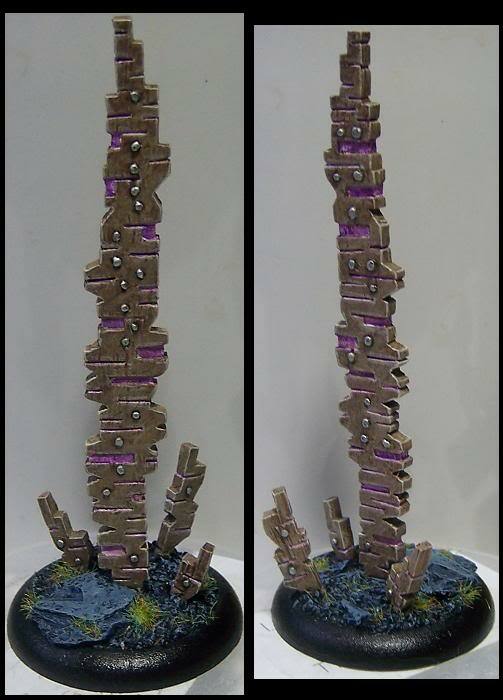 I recently made six objective markers from some scenic bases that are the faces of smashed statues. Quick and easy to put together and they turned out great once I painted them. I never leave home without them. Good to hear people are still making their own stuff! Putting together a few simple and fast markers can be a breeze and gives you something extra to add to the gaming experience. @ Warflake - thank you very much!